Posted April 23rd, 2006 by Ms. Jen & filed under news + events. Sun 04.23.06 – Kind of like my internet connection. The Trinity network point in my room has not been working for over a month. Supposedly, they are coming tomorrow to attempt to repair the line, supposedly. My Irish Broadband wireless has been slower than a 9600 baud modem and won’t send anything out. Good thing my mobile phone is working. Posted April 22nd, 2006 by Ms. Jen & filed under fun stuff. 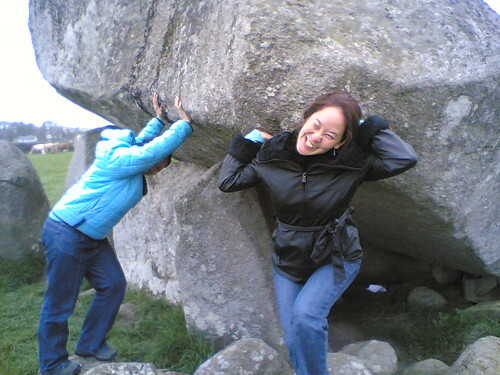 Sat 04.22.06 – Ruth & Erika attempt to lift the 150 ton capstone of the Brownshill portal tomb. 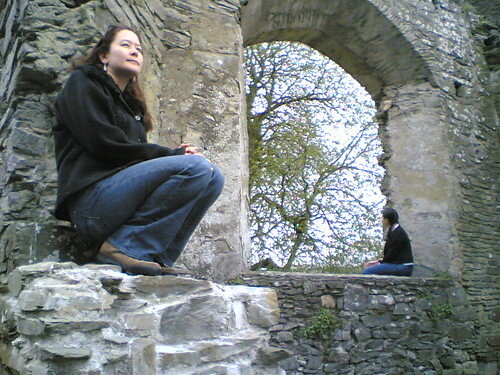 Posted April 22nd, 2006 by Ms. Jen & filed under ah, ireland. 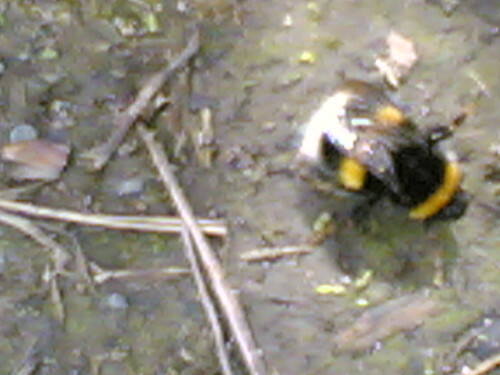 Sat 04.22.06 – Moone Abbey, Co. Kildare. 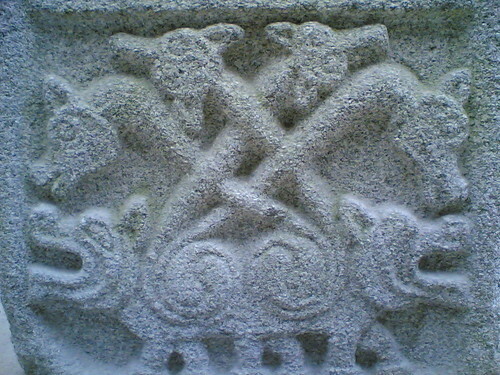 Southside base carving of an interlaced animal form. Posted April 21st, 2006 by Ms. Jen & filed under Uncategorized. 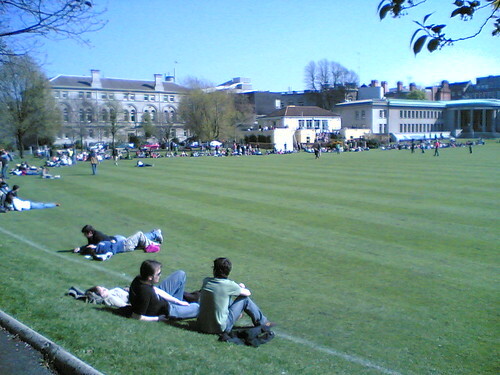 On the Trinity College green. 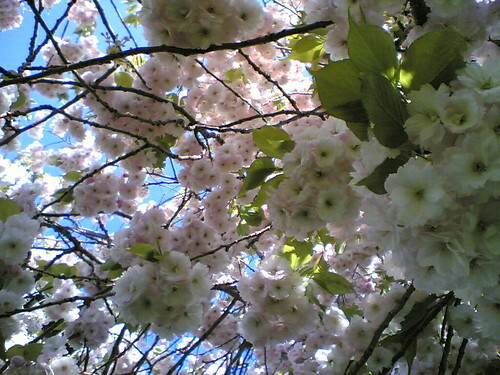 Posted April 19th, 2006 by Ms. Jen & filed under nature + environment. Across from College Green at Trinity. Posted April 18th, 2006 by Ms. Jen & filed under fun stuff. Erika! We are at lunch at Mash. Posted April 17th, 2006 by Ms. Jen & filed under Uncategorized. 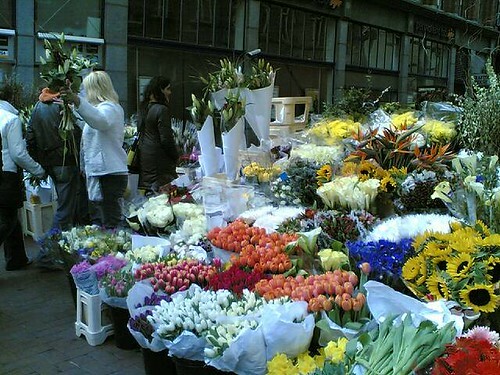 Mon 04/17/2006 11:54 – Spring tulip cheer compliments of the Nederlands. We are now in the third day of dry, mostly thick, gray dreary clouds. Today is Easter Monday bank holiday, I am getting errands and work done in anticipation of Erika’s arrival.